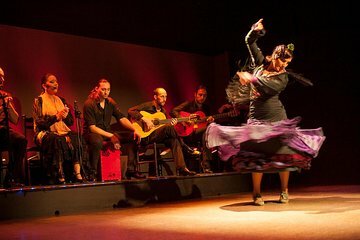 Miste dig i de spændende rytmer og dramatiske kostumer af den spanske flamenco med et fod-stomping flamenco show på Palacio del Flamenco i Barcelona. Forbered dig på at blive grundigt underholdt, da du nyder en spændende 1 timers præstation, ledsaget af levende musikere og cantaores (sangere). For den ultimative oplevelse opgraderer du til et glas Sangria, traditionelle tapas eller en lækker spansk stil middag. Thoroughly enjoyed the experience. Had heard of the Flamenco dance and seen glance of it in a popular Bollywoood film but the actual show was very fascinating. Thanks! It was certainly a Spanish themed evening with Flamenco, Sangria and Paella so the novelty factor was there. It felt very rushed though . There is a 10 minute prelude to this show where guests are shown things about the flamenco show which we missed because it was not clear on the information. Having said that, the show was fantastic. Very impressive. I loved the show. This was a fantastic show- the talent was amazing. Not to be missed. Wish I could order my own drink . Not a big sangria fan. The dancers were superb and full of life. Even the pre-show tutorial dancing lesson was a great touch. The food was just okay though. The Sangria however made up for it. :- Fabulous show! The show lagged at times. Very authentic flamenco show. Small intimate theatre so very close to stage. Only one hour but well worth the experinece. Sooo pleasantly surprised!!! A definitive MUST. I am giving this four stars but that is strictly for the dancing which was amazing. However, the food was really pretty awful! Would have preferred to have just paid for the show.